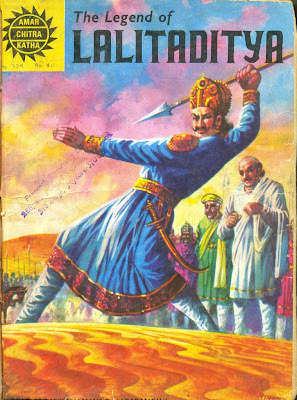 This ACK is based on Kalhana's Rajatarangini. 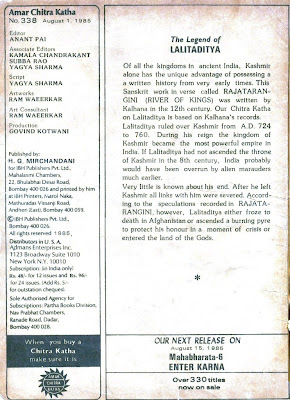 Kalhana's Rajatarangini is the most famous historical poem which records the oldest and fullest history of the legendary kings of Kashmir as well as gives accounts of the Kashmirian kings of the historical period. It consists of eight chapters and draws upon earlier sources, notably the Nilamata Purana. It represents a class of Sanskrit composition which comes nearest in character to the chronicles of Medieval Europe and of the Muhammadan East. Together with the later Kashmir chronicles which continue Kalhana's narrative, it is practically the sole extant specimen of this class. Its author's object is to offer a connected narrative of the various dynasties which ruled Kashmir from the earliest period down to his own time. The final portion of the work, considerable both in extent and historical interest, is devoted to the accounts of the events which the author knew by personal experience or from the relation of living witnesses. These events are narrated from the point of view of a more or less independent chronicler and by no means the purely panegyrical object of the court-poet. Read more details at Wikipedia. Read online Kalhana's Rajatarangini HERE. Many many thanks to “Apoorva Chandar” for providing ACK scan. Thank you Apoorva! Thanks Prabhat!! Woo hoo - so many ACks - many many thanks. PS: Prabhat, can you please re-check the Jataka tales part 3 (ACK 89-90) higher resolution file? i am not able to un-rar it. Samik: Welcome! There are 50 more ready, in fact I'm posting too slow. Rajeev Sharma: Welcome! This Holi should have various colours! Amith Nag: Welcome! I wrote only two numbers as 1 was posted earlier. In fact there is need to download all 3 HR files and join. SR links are as story, but HR at size. Pls check & inform again. Otherwise I'll upload all 3 HR files. I deleted from computer it's parts. Samik: I'm trying my best, my friend. Many new ACKs are coming. 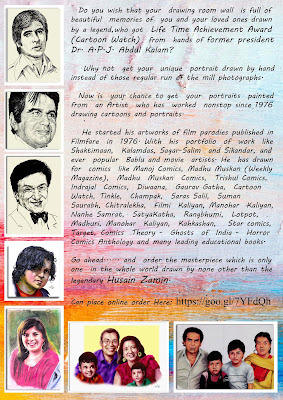 Golden Chance: Get your Portraits from legendary Husain Zamin! Aznaabi, LMP, Frank, Anupam Agrawal & CW. Our goal is finding out more details about history & mythology of India. All materials used here, for informational purpose under fair use policy only.